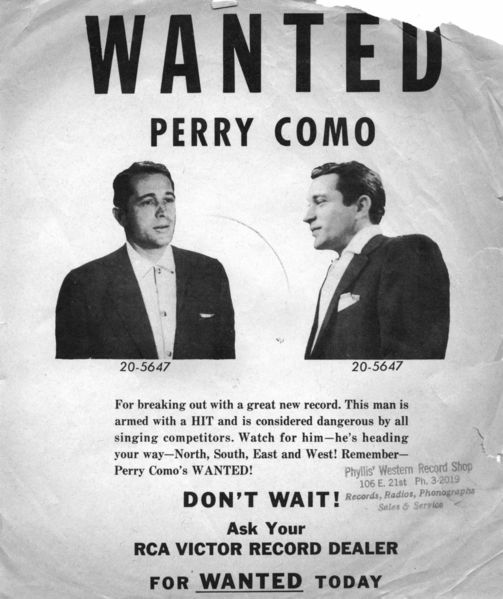 In 1954, Perry Como released “Wanted” on a 10-inch 78, with “Look Out Your Window” as the B-side; both went up in the charts quickly with Wanted hitting #1. Despite Como being in the prime of his career, RCA made sure the word got out and released this promotional flyer, perfect size for slipping in the 10″ record sleeve of Como’s other albums. Como is accused of the horrendous crime of ‘breaking out with a great new record’ — something ‘dangerous [to] all singing competitors’! Accusing the white-bread, good-natured Como of a crime was a playful turn, but a bit different from the song: Wanted’s lyrics addresses a woman’s criminal act of finding her way into another man’s arms. It seems everyone was engaging in criminal activities! The final line of Como’s crimes uses a apostrophe pun. It could mean, depending on whether the apostophe is a contraction or a possessive, either “Remember — Perry Como is Wanted”, or “Remember Wanted, by Perry Como.” That number under Como’s name? It looks like it could be the number off his jailhouse uniform…but it is, in fact, RCA’s catalog number for the Wanted record. As a sidenote, I tried to track down Phyllis and her Western Record Shop. Sadly, I have no way of knowing where she was located. 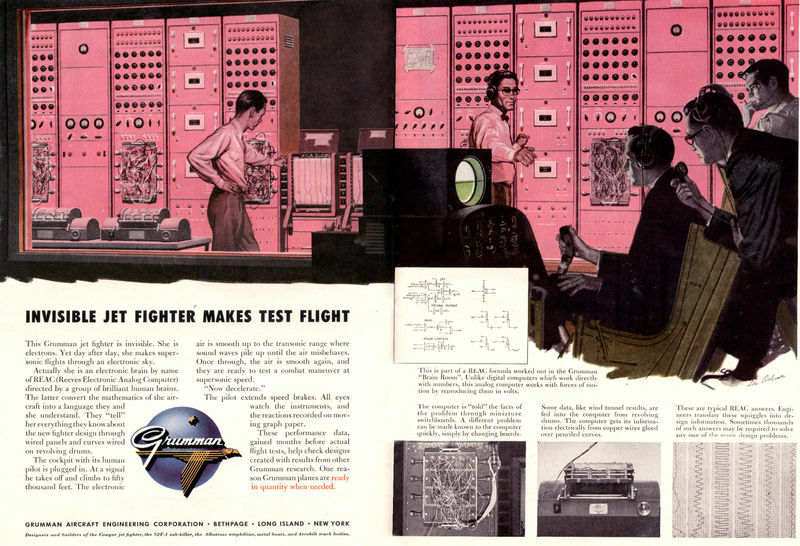 I got this flyer exactly how it was intended — stuffed in a 78 of one of Como’s other early-fifties albums — but it was purchased from a travelling Texan antique show dealer, so Phyllis could have been dealing in phonographs anywhere from here to Amarillo. 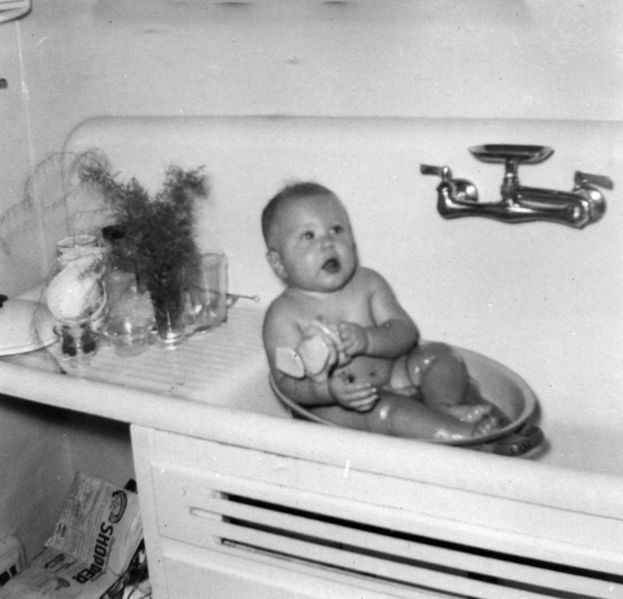 I know I’ve been heavy on the analysis lately, so in today’s post I have nothing to say about the sink; I can’t tell you about the toy the baby is playing with; I don’t know where the newspaper is from, or what its articles are about; I have nothing to say about asparagus ferns being grown in drinking glasses nor the appropriate use of a roasting pan to bathe small humans. All I know is there’s some 55-year-old man who probably doesn’t want the whole world to see him naked….yet here he is.